California is my home state. (Ironic, that I study the history of Virginia for Civil War studies, eh?) California played a significant role in 19th Century American Maritime History. Part of California’s role had to do with its location. West Coast of the United States, bordered by the Pacific Ocean. When California was a Mexican province, its people started welcoming the American merchant ships. When California became a state in 1850, the gold rush brought thousands to the west coast. California’s location also made it a gateway state for immigrants and a last port before a ship set off across the Pacific Ocean. Today we’ve rounded up five important aspects of California’s maritime history of the 19th Century. We’re keeping it simple for the sake of time, but feel free to add comments if you have more information to contribute. Carrying dried cow hides out to the waiting ships. The U.S. Navy had store rooms in California ports during the Mexican Era (prior to 1846) for the Pacific Squadron. Gunpowder, fresh food and water, and other supplies could be obtained through the store rooms. During the Mexican-American War, thirteen U.S. ships were stationed off the California coast. With the conflict progressing on other fronts, the United States was anxious to seize California before a foreign power (Britain) made an attempt. The navy captured and occupied important port cities like Monterrey, San Francisco, and San Diego; many towns surrendered before shots were fired. Following the conflict, California became a U.S. Territory and – two years later – a state. Californian ports provided safe harbors and “home bases” for American navy vessels through the latter half of the 19th Century and continues to welcome the modern ships and fleets. The California Gold Rush began in 1850, and “gold fever” swept through the United States and the world. Men quit their jobs, invested in pick and pan and headed for California. But how did they get there? Two-thirds of the choices involved sailing. Passenger ships vied with each for speed and boasted of their successes in order to charge their gold-frenzied passengers more expensive passage. 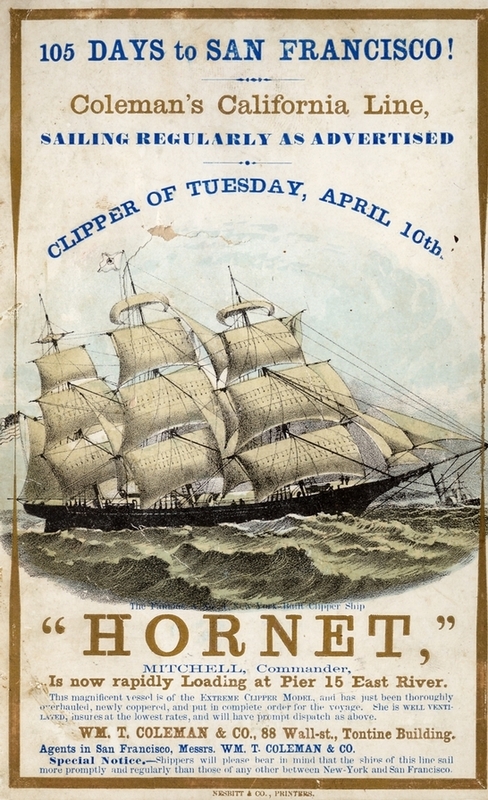 Clipper ships and steam ships were the major methods of transportation. Once the ships arrived in San Francisco harbor, many crews and captains jumped ship, following their passengers to the inland gold fields. An observer described the harbor as a floating forest of ship masts and remarked on the oddity of the abandoned ships. The California Gold Rush brought people from many countries, backgrounds, and ethnic groups to the new state. These new arrivals brought their skill-sets with them and – when the fun in the gold fields ended – the “prospectors” started looking for new ways to make a living. With fresh meat limited in the California markets, fish and seafood became a welcome source of protein. Azorean-Portuguese and Chinese immigrants embraced the opportunity and constructed fishing fleets. 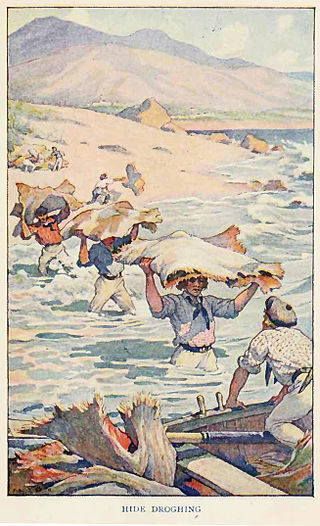 At the very end of the 19th Century, (1899 to be exact) collapse of the Italian sardine fishing industry prompted many Mediterranean-based fishermen to immigrate to California, launching the sardine fishing and canneries – an extremely profitable maritime related business in 20th Century California. 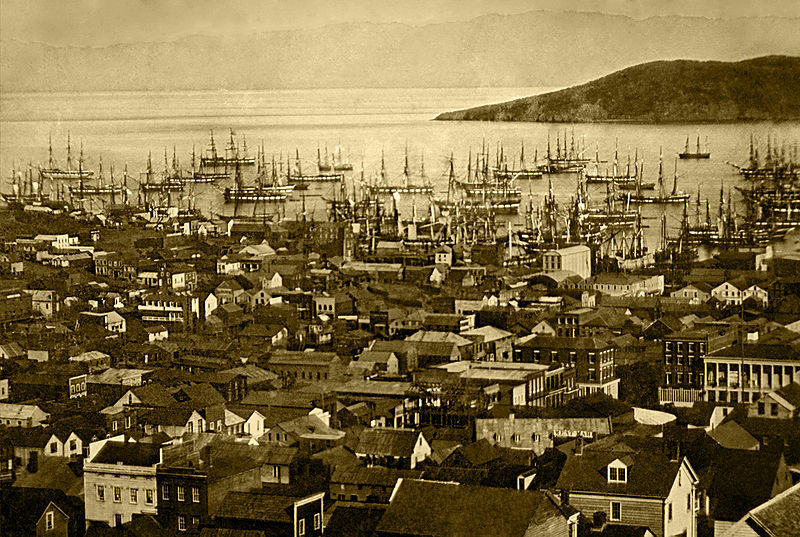 The Gold Rush prompted the development of San Francisco harbor. Along the shore, it grew from a collection of wooden shacks to a full-fledged city. For a while, it was the only west coast harbor designated for port of entry and hosting the U.S. Customs Office. This meant that a huge variety of foreign imports channeled into the harbor, adding to the city’s wealth, national and global importance, and diversity. Next Pydna: A Greek Or Roman World? Thank you for commenting. It means a lot to me to hear that you’re enjoying the blog posts. Do you have a favorite historical era or topic? Do let me know and I’ll consider it for a theme of the month; I like to hear from readers and know what’s interesting to them! Hmm…that sounds like an interesting topic. I’ll keep it in mind.